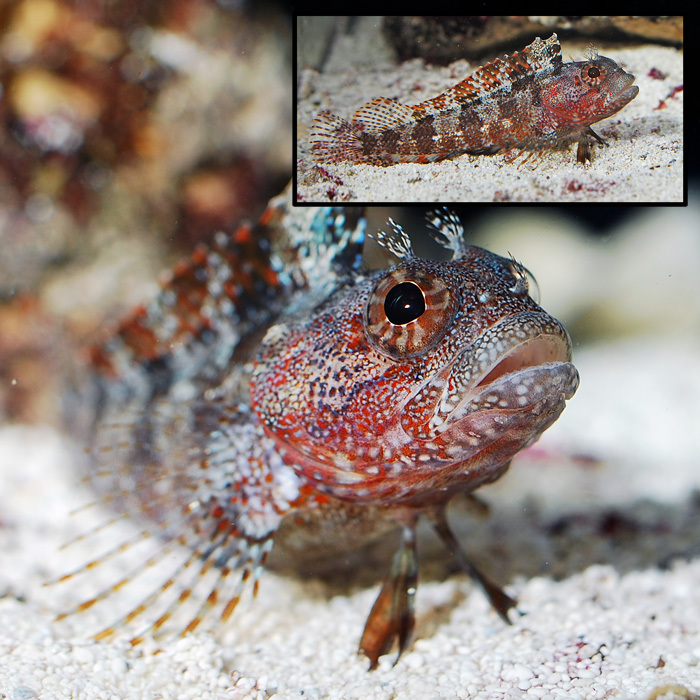 The Downy Blenny is a blenny from the Caribbean that isn’t seen in the aquarium trade as often as other blennies. At first glance they appear to be just brown, but on further inspection, beautiful red and blue patterns can be seen on the face and body. Individuals vary in coloration, and each pattern is unique.They feed mainly on crustaceans like small amphipods and will eat frozen mysis shrimp and enriched brine shrimp in captivity. They do well in reef aquariums, but may prefer temperatures on the cooler side, so don’t attempt to house them in a tank that reaches more than 78 degrees. They’re mostly peaceful, but may nip at similar fish in a small aquarium.